What 'hit dramas' were born in the new millennium? In a research conducted based on data from January 1st of the year 2000 to the 26th of this month, TNS Media Korea ranked MBC's 'Dae Jang Geum' to be at the top with a 41.6% viewer rating average. Following in second was 'Lovers in Paris' of SBS which aired in the summer of 2004 at 41.5%. MBC's 'Jumong' which will end soon after breaking the 50% viewer rating line ranked third with a 40.6% average viewer rating. MBC's 'My Lovely Sam-Soon' which brought about the 'Sam-Soon' craze in the summer of 2005 ranked fourth at 37.7% while 'Tae Jo Wang Geon' of KBS, despite airing over a period of a year and eleven months, ranked fifth with a 37.3% average viewer rating. 'Jinshil' that starred Choi Ji Woo and Ryu Shi Won back in 2000 ranked 6th with a 36.9% average viewer rating while 'My Rosy Life' starring Choi Jin Shil ranked 7th with 34.2%, followed by 'Stairway to Heaven' of SBS with 33.9%. 'All In' (2003) and 'Successful Story of a Bright Girl' (2002) both aired on SBS ranked within the top ten with an average 33.7% viewer rating. If the highest viewer rating surpasses 50%, the series is generally called a 'national drama,' yet observing the average viewer rating allows comparisons of which drama series had a constant level of popularity. In the case of 'Tae Jo Wang Geon,' it is notable in that it ranked 5th among series that usually end in two to three months. 'Dae Jang Geum' and 'Jumong' both also aired and have been aired for more than six and nine months respectively but still managed to rank among the top ten. While 'Jumong' is a special case in that it is still being aired, there are only two episodes remaining with high expectations for the conclusion. It is projected to retain its position as third even after the last episode has aired. Director Chae Jae Woong of TNS Media Korea commented, "While the highest viewer rating is only instantaneous, the average viewer rating truly shows the popularity of the series and therefore ones with high average viewer ratings can be considered a 'hit drama.' It is especially difficult for regular drama series whose lengths exceed miniseries by more than several times to maintain a high average viewer rating. Kim Jung-Hoon, who decided to stop his studies at Seoul National University Dental School to become an entertainer, is putting on the white gown after all. The new SBS Wednesday Thursday drama ‘Manyeo Yuhui’, will be broadcasted, starring Kim Jeong-Hoon as a thoracic and cardiovascular surgeon. Kim Jeong-Hoon entered Seoul National University Dental School in 1998, but withdrew from the university in 2003 after finishing 4 semesters to pursue a career as a singer/actor full-time. He declared several leave of absences as a registered student while he was a member of the popular music group UN with Choi Jung-Won. After his singing career with UN, Kim Jeong-Hoon transferred to Chung-ang University College of Arts as a third-year student of the Department of Theater, during which he was suddenly cast for a part in the drama ‘Goong (Princess Hours)’ which is based on a comic book he had enjoyed reading. Therefore it was not a hard decision to make; Kim Jung Hoon soon agreed to participate in the drama, which became his first serious role as an actor. Kim Jeong-Hoon previously appeared in the movies ‘DMZ’, ‘Kkabulgima’, etc. However, as he recalled his acting experience prior to the drama ‘Goong’’ he revealed, “Back then I didn’t feel like I was acting, but rather that I was faithfully fulfilling my daily schedule. 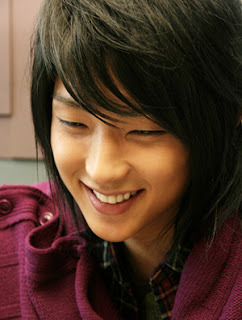 It was the drama ‘Goong’ which made me realize that gave me more of a desire to become an actor. I knew then that I must follow my heart.” In the upcoming drama ‘Manyeo Yuhui’, Kim Jeong-Hoon plays a thoracic and cardiovascular surgeon who is rivals with Jae-Hee. They both try and in the heart of Han Ga-In. His character Yu Jun-Ha, is the female character Ma Yu-Hui’s (played by Han Ga-In) first love. Yu Jun-Ha is a cold-hearted character who is capable of betraying his most precious love for success. Though Yu Jun-Ha is an ambitious two-faced character, he is a bad guy in the sense that his weakness stems from his strong desire for success. In order to play this character role, he is working out to tone down his soft gentle image 2 hours everyday to build a more muscular physique. He is also dieting to make his face look slimmer for a sharper, masculine image. Kim Jeong-Hoon is trying in everyway possible to get ready for this new transformation of playing a ‘bad boy’ character, and with all his efforts his fans are looking forward to seeing not only his acting, but this new fresh image. The Korean television drama series 'Hotelier' starring Bae Yong Joon will be remade in Japan. Japan's Sankei Sports Newspaper reported on the 20th, "The hit drama 'Hotelier' will be remade in the coming April by TV Asahi. 'Hotelier' which will be aired on Thursdays at 9pm will star Ueto Aya and will draw the story of a hotel which is about to undergo a mergers and acquisition." The MBC drama series 'Hotelier' which aired in 2001 was a story about a five-star hotel fighting through a mergers and acquisition, and featured the love story of a corporate hunter (Bae Yong Joon), hotel general manager (Kim Seung Woo), female manager (Song Yoon Ah), and the daughter of the chairman leading the mergers and acquisition (Song Hye Gyo), and was aired on Tokyo MXTV, NihonTV, and others, adding to the Hallyu Boom in Japan. The Japanese remake of 'Hotelier' will start filming in mid-March. Actress Song Hye-kyo and singer/actor Rain will visit China to promote their drama "Full House," which aired on KBS 2TV a few years ago in Korea.They will leave Seoul Thursday for a 3-day visit to Hunan, China, where a news conference and a fan meeting are scheduled ahead of the drama's local airing.Song's manager Na Byung-jun of Sidus HQ says inquiries by Chinese fans about their visit are pouring in.The hit drama was exported to 14 countries including Thailand, the Philippines and Taiwan.Actress Song has recently finished filming her latest movie, a film about the famous Korean courtesan Hwang Jini, while Rain is on his global concert tour. A Korean historical TV drama that was a big hit in many Asian countries is now ready to move to the stage as a musical. Called "Daejanggeum" in Korea and also known as "A Jewel in the Palace," the producers are hoping to take the musical overseas after first showing it to local audiences. Elaborate costumes, a tight plot and talented performers. The new production of "Daejanggeum" has all of those elements, and is set to hit the stage in May. The production is based on the TV drama of the same name about a woman who goes from royal chef to court physician. “‘Daejanggeum' has aired in 50 countries, so its storyline is well-known and it has name value,” Song Seung-hwan, the musical’s producer, said. “We have here today people from a Chinese theater, a Japanese broadcaster and a Singaporean stage company. They're very interested in the musical 'Daejanggeum,' and want to show it in their countries." The TV series set a host of records during its run in Korea between September 2003 and March 2004. It was also a hit in other Asian nations such as Taiwan, Singapore and Japan. The musical version could ride on the coattails of the Korean Wave or hallyu, and further spread Korean culture and influence throughout the world. The musical's production company PMC is already famous for creating the hit percussion dance show "Nanta." PMC says it'll focus on the Korean market this year with shows in July in Daegu and at Seongnam Arts Center south of Seoul in August. The company will then seek to hold performances next year in Southeast Asia and other countries. korean Singer Lee Hyori is starring in a 70-minute drama. Mnet has invested $3.7 million into the production of this drama which will be filmed from the 3rd to the 20th. . Lee Dong Gun and Jung Jun Ho will be co-starring with Lee Hyori, playing roles for a love triangle.Lee Hyori is a would-be singer who has been preparing for her career for 3 years. The day before her debut she hears some shocking news which throws her into despair. Lee Dong Gun is an unemployed loafer who meets Lee Hyori by chance and the two fall in love. Jung Jun Ho plays a representative of an entertainment company who meddles in the two people’s relationship.In mid-February, Lee Hyori will be releasing 3 new songs which will also be featured in the drama’s soundtrack, attracting a variety of interests. Cha Eun Taek is the director for the music video. Lee Dong Gun, Lee Hyo Ri, and Jung Joon Ho lead the TV Mnet 2-episode drama “Perhaps Love"
LDG plays the role Jung Tae who manages activities for a rookie singer played by Lee Hyo Ri. The roles played by LDG and JJH fall in love with the heroine. The production cost of this drama is around 5 billion Won. Other actors including Lee Bum Soo, Ha Suk Jin, Jung Eun Taek and Jung Chul will also act in this drama. The filming is scheduled to start on 2/3 near Seoul and would last for 20 days. The PD is Cha Eun Taek who has collaborated with LHR in CFs such as “Any Motion” and “Any Club”. 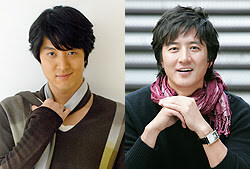 LDG’s previous drama was “Smile Again (2006)”, and LHR’s was “Three Leaf Clover (2005)”.